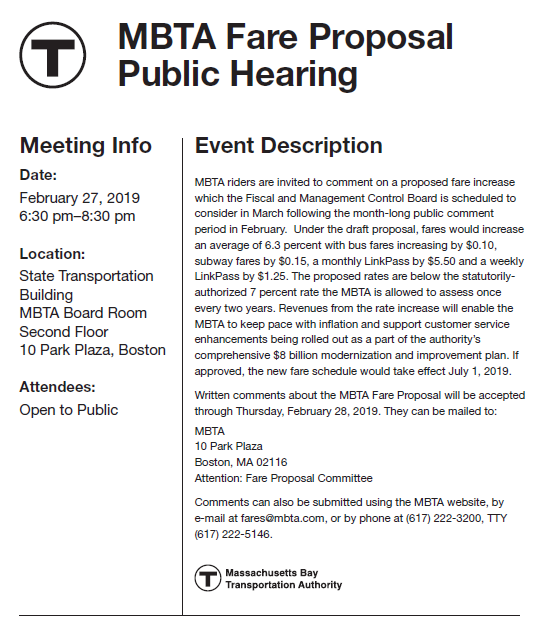 On February 27th the MBTA will conduct a hearing open to the public on the system's proposed fare change. The public hearing takes place at the state's Transportation Building at 10 Park Place from 6:30 to 8:30 in the evening. According to a draft MBTA proposal, fares will go up an average of 6.3%. Bus fares increased by $0.10, subway fares by $0.15, and monthly LinkPassed by $5.50. The MBTA is allowed to assess fares once every two years with a 7% cap. The MBTA says revenues from the rate increase will enable them to keep pace with inflation and support customer service enhancements being rolled out as a part of the authority’s comprehensive $8 billion modernization and improvement plan. If approved, the new fare schedule would take effect July 1.